As the full tide was around 1.30pm…..we decide to start around 10am….LK and An both of them early in the morning went to the jetty to get fresh tamban for bait. 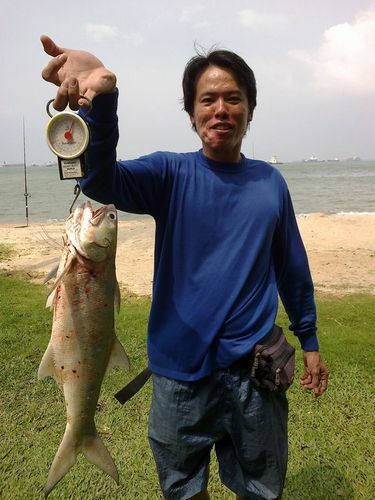 We setup and casted out…total there is 9 rods….Tide is already mid way up…..JW was the first to hit….He saw his rod rattle and he strike…..without much effort….a nice 1kg threadfin was wind in…. With this…it boosted our moral….everbody changing bait….more often….An hour later…..suddenly LK rod bent and his reel screech…..He rush to strike and the fish jump up from the water surface….WOW….threadfin again….with the aid of the wave….he slight in the fish…..It hit the scale at 1.8kg…. Fantastic….we never dream of getting this at the beach….But….it happen…….We pack off around 2pm when the tide turn down.